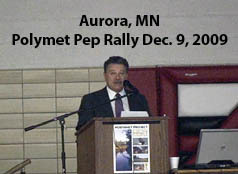 The Minnesota DNR allowed politicians to control the format of this public meeting and turn an informational public meeting into a Pep Rally for Polymet, a Cu Ni Sulfide Rock mining company. No public comment was allowed. Bused in miners, at whose expense we don’t know, wore stickers and sweatshirts shouting their support for Polymet. “Desperate for Jobs” was the cry. Informational tables setup with knowledgeable scientists from the DNR and Minnesota Pollution Control agency were present. But, as with the “comments accepted” by stenographer, special effort had to be made to by those concerned with major environmental issues glossed over by the rally.